Bharatpur State was founded in 1722 by the Sinsini Jat Badan Singh (r.1722-33) who became the first Raja of Dig in 1722. Bharatpur became the state capital in 1733 when it was captured by Badan Singh’s son, Suraj Mal (r.1733-63). Most of the palaces here were built by Suraj Mal, the largest of which, the Ghopal Bhawan, was the king's summer residence. 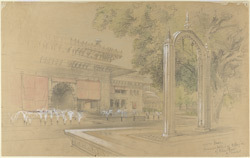 Details on the façade are characteristic of Jat architecture, such as the balconies supported on carved brackets and the curved bangaldar roof that can be seen to the right in the drawing.